Join the discussion on our forums! Come discuss Drakkari Enchanter over in our dedicated Drakkari Enchanter discussion topic. 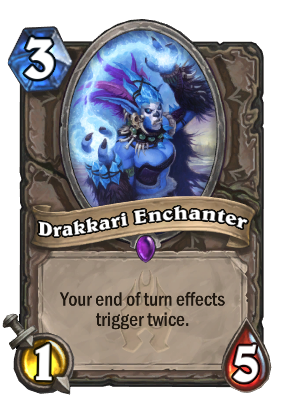 Apparently she makes scheme cards ( Dr. Boom's Scheme Hagatha's Scheme Togwaggle's Scheme Lazul's Scheme Rafaam's Scheme ) upgrade twice so she might be used in wild more often. Very interesting card. And really good. Now we have a minion for each mechanic? Battlecry for Brann Bronzebeard, Deathrattle both Baron Rivendare andSpiritsinger Umbra. i think this is one of my fav cards! its just so fun and can potentially be very powerful. Im too lazy to scroll back but 2 enchanters wont make triggers 4 times. I tried it. It will make 2 of something trigger twice tho. Like cobalt scaleable, shadow ascendant and that one armor guy. Pair this with Herald Volajz (or however you spell it) while everyone's tucked behind a taunt and watch ppl concede left and right. That is a great question. Will test it after work and get back to you! Sadly, no, you will only get one 30/30 minion after all that. Sounds like Cree Summer's voice. i think it shouldn't work, because echoing ooze has a battlecry, not an end of turn effect. that being said, i don't think that situation has ever come up before, so we'll have to see. i think you're out of luck with that though. and a wee bit sturdier and also not as threatening so it definitely has stronger survivabilty to go off. it's just too bad you can't get it to go off with LK, ysera, or either ragnaros on the same turn most times.